Brad is a native Memphian and has been active in the community throughout his life, culminating in his involvement in the 2004 presidential campaign for Howard Dean. This in turn led to his efforts to turn the local Democratic party back toward its progressive base; from 2005 to 2006 he sat on the Executive Committee of the Shelby County Democratic Party. He was a long-time volunteer with the Mid-South Peace and Justice Center when he worked on the Memphis Living Wage Campaign, the Coalition Against Private Prisons and the campaign to end the war in Iraq. Watkins is now convinced that true positive social change can only come from the community itself and that the progressive movement must be committed to the task of organizing with those who are directly affected by injustice. In 2008 Watkins was accepted into the D.C.-based Center for Community Change’s GenChange program as a fellow and oversaw CCC and MSPJC GOTV efforts in four low-income, low voter turnout communities of color in the 2008 local elections. 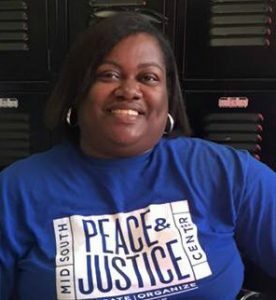 Watkins joined the staff of the Mid-South Peace and Justice Center in December of 2008 and since then has overseen the Center’s programs and campaign efforts on homelessness, blight, foreclosure, the Neighborhood Alliance, criminal justice reform and electoral organizing. He became Executive Director in 2014. Born and raised in Shreveport, Louisiana, Paul relocated to Memphis in 2006 to attend Memphis College of Art where he graduated in 2011 with a Bachelor’s in Fine Arts. 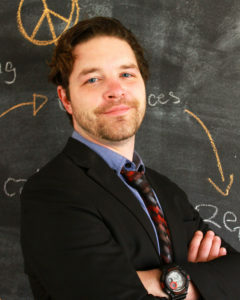 Paul got involved with MSPJC in 2011, working to coordinate teach-ins and actions in solidarity with the Arab spring. 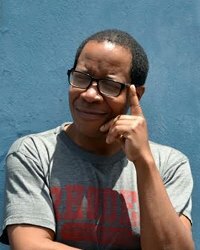 He was deeply involved in the Occupy Memphis encampment where he helped co-found the Homeless Caucus, making sure that homelessness was not just a ‘backseat’ issue. The Caucus joined forces with MSPJC, and eventually became the core membership of H.O.P.E. Paul worked with the Transportation Task Force, organizing and facilitating town hall meetings that lead to the founding of the Memphis Bus Riders Union. In 2012, Garner began working full-time with H.O.P.E. through the Americorps VISTA program. The next year, Paul joined the MSPJC staff as Organizing Coordinator, working first with HOPE, and later coordinating the Center’s work around Criminal Justice Reform through Memphis United. In 2017, Paul took over as the Center’s Organizing Director, working to provide behind the scenes support and guidance to MSPJC’s organizers. Tamara Hendrix is a native Memphian and writer. She mainly writes short stories, and was published in a collection called, “Writing our Way Home: A Group Journey Out of Homelessness.” Tamara first interacted with the Mid-South Peace & Justice Center in 2012 as a member of H.O.P.E (Homeless Organizing of Power & Equality). As a H.O.P.E. member she held the offices of Secretary and Vice President, organized the H.O.P.E. Women’s Caucus, and aided in the formation of the Streetwise Ink screen printing project. In 2014, Tamara began working with the Mid-South Peace & Justice Center as the H.O.P.E. Capacity Builder through the Americorps VISTA program. After the completion of her VISTA contract in 2015, she accepted the position of Organizing Coordinator for H.O.P.E., coordinating the Center’s work around homelessness working exclusively with people experiencing homelessness and those who have formerly experienced homelessness. Born in St. Louis, MO, Justin Davis came to Memphis to study at Rhodes College, where he majored in English and Greek & Roman Studies. 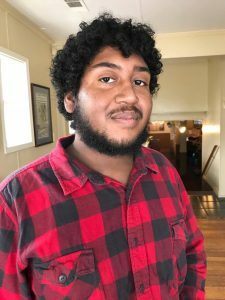 He first came to Mid-South Peace & Justice Center in 2015 as an intern through the Rhodes Bonner Scholar program, and got involved with both the Memphis Bus Riders Union and Memphis United’s CLERB campaign. Soon he focused his work on public transit issues, and the next year he was elected to MBRU’s Executive Committee. In 2017, Justin was recognized for his service work with the Vanderhaar Student Peace Award. After graduating from Rhodes with his Bachelor of Arts in English and Greek & Roman Studies, he joined the MSPJC staff as MBRU’s Organizing Coordinator. Faith Pollan was born in Lakeland, FL but grew up here in Memphis, TN. She graduated from Christian Brothers University in 2012 with a Bachelors in Business Administration with a concentration in Management. Faith became involved with the Green Party of Shelby County, as well as phone banking efforts for Tami Sawyer during the 2016 election cycle. 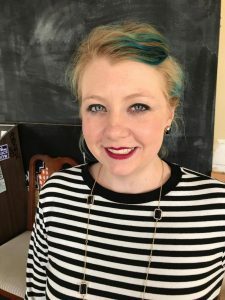 She has served as the events committee chair for the Memphis Feminist Collective since the winter of 2016. In the fall of 2016, Faith formed the Mid-South Reproductive Rights Coalition in an effort to better unify volunteer efforts for local sexual health organizations. She originally joined the MSPJC team as a community organizing coordinator as part of the Juvenile Justice Project and now serves as the Operations Coordinator.